Let me tell you, we spent at least a minute staring at the nondescript door before a coupla folks inside stared us down. Only to realise that 'Mary's' was sprawled clumsily in marker at the top... yes there is no sign. It's pretty hidden but you'll find it next to Kelly's On Kings back entrance. The atmosphere was relaxed on a weekday afternoon.. there is an upstairs level which we headed towards which is much more suitable for couple time with candlelit tables for extra intimacy ;) The lighting is highly dim even for the day time. FIRST OF ALL, I regret not trying the cheeseburger or the vegetarian shroom burger instead. 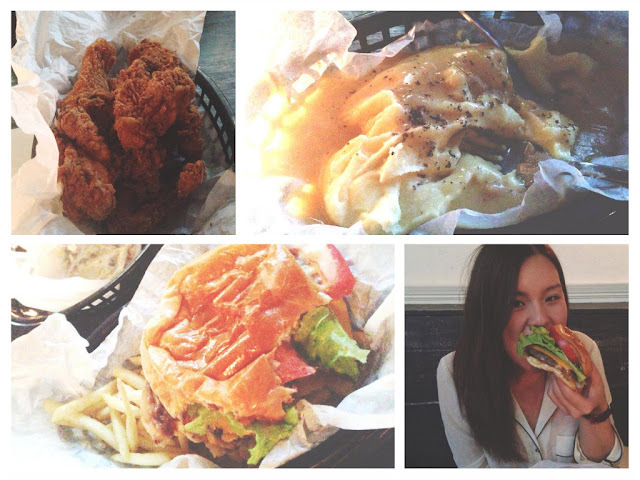 But we decided two people can't stomach more than one burger, half a bird, fries and some mash! The burger had the extra grease factor with some type of mayo aoli sauce (reminiscent of Hungry Jack's whopper...) that made the burger soggy after about 10 mins :( I'd have to say the burger was pretty average with the lettuce, tomato and the patty. The fries are compulsory with the burgers. There is an option of adding Trashcan bacon $4 / double and double-down (patties) to the burgers for $3 extra. The succulent fried chicken was to DIE FOR. If only they had options for smaller portions. Definitely some real gritty pub food! The chicken is incredibly tender and juicy with the added crunch. When dunked in the mash and gravy (A MUST! ), oh boy I was on a whirlwind to foodie heaven. I'm pretty sure the boy devoured half that mash, after agreeing that it was the highlight of the meal.